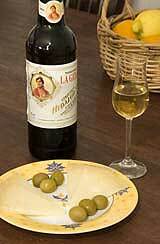 No website or book about tapas would be complete without a page or two about sherry. It is a match made in heaven. There is absolutely nothing wrong with wine, or beer, or anything else that takes your fancy to have with your tapas but until you try it with sherry, youre missing out on a taste tradition going back thousands of years. The first documented mention of sherry comes from 1 BC and this source mentioned original vines brought by the Pheonicians in 1100 BC! First things first: The Spanish do not call their wine sherry. 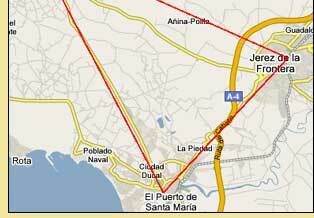 This is an anglicised version of the word Jerez (which is pronounced hereth with the accent on the second 'e'). To be considered a genuine sherry a wine must come from the sherry triangle which is a region on the Atlantic coast of Anadalucia bordered by the towns of Jerez de la Frontera, El Puerto de Santa Maria and Sanlúcar de Barrameda. So, no matter what it says on the bottle, anything else is just fortified wine in the style of Jerez. There is a type of sherry for every kind of food and a little understanding of whats available and what goes with what will make your tapas experience even more enjoyable. Plus a couple that are a bit different and harder to find. As with wine, the different regions are governed by the Denominaciónes de Origen which control their quality. Well cover the main types first. First we have the dry sherries Fino and Manzanilla. These are pale in colour, bitingly dry and delicately flavoured. The Manzanilla has a salty, nuttier taste. They are primarily served as aperitifs before the meal and with tapas as a starter. However, many Spanish people drink these as a wine throughout the meal. They are very versatile wines which go perfectly with jamón, chorizo, mild cheeses, white fish and all seafood. Next up comes the medium-dry Amontillado. This is a golden amber colour with a dry but nutty taste. It goes well with poultry and game, robust cheeses and oily fish like sardines and mackerel. A darker, richer sherry but still a medium is the Oloroso. This is perfect for red meats and stronger game dishes. Finally comes the dessert sherries Moscatel and Pedro Ximénez. These are both very sweet and are perfect for desserts and blue cheeses. The Moscatel is a softer wine and the Ximénez is a rich, dark Spanish beauty in a glass! A couple of options for you to try are a Palo Cortado and a Pale Cream. The Palo Cortado is a rare wine which is a sort of cross between an Amontillado and an Oloroso. Drink it with the richer foods like game, strong cheeses, etc. Youll probably find the Pale Cream more easily available. This is basically a fino that has been sweetened. It is an interesting flavour and goes well with rich patés like foie gras, or try it with fresh fruit and nuts. A commonly-found sherry is the Cream. This is a dessert wine in the style of the Ximénez but not so rich - or expensive! Try it with sweets, pastries and blue cheeses. The best sherry glasses are the thin, transparent copitas which are designed especially for the job. They are long-stemmed, to prevent your hands warming the wine, and have a taper towards the top to funnel those subtle and distinctive notes nicely to the nose. Dont fill the glass more than halfway or the wine will not have a chance to blossom and release its aromas as you swirl it around the glass. If you cant lay your hands on some proper copitas then a champagne flute would be the next-best alternative. Failing that just slosh some into a wine glass. You heathen! But better to drink from a wine glass than not to drink at all, thats what I say. Unopened bottles of sherry are very susceptible to oxidisation so should be stored upright, not laid down, in a cool and dark place at an even temperature. Fino and Manzanilla should be bought fresh and used quickly, within three months, as they do not last well in the bottle. They should always be served chilled. Once opened, keep in the refrigerator and consume within a couple of weeks. These wines are very delicately flavoured and lose their character very quickly once opened. Amontillados can be kept in the bottle for two to three years but, again, once opened, should be consumed as quickly as possible. The ideal temperature to drink these is a cool room temperature. However, once they have been opened you should keep them in the fridge if you dont have a cool place to keep them. Drinking them cold is perfectly acceptable. The Olorosos, Creams and Ximénezes, being richer and more aged, can be kept in the bottle for years, depending on the quality of the wine. Once opened, they can be kept for months in a cool place, or in the fridge. But bear in mind that they should be served at room temperature to appreciate them at their best. Although a pale cream, or even a cream, on the rocks is a delicious alternative. All sherry, once opened, should be stored upright with their corks firmly in place to prevent oxidisation and loss of flavour. There is, of course, a very simple answer to this problem of storage and oxidisation. You simply prepare some little dishes, get a few friends round and open your best bottle of sherry. Then throw the cork away! What better way to enjoy your sherry and tapas than the proper Spanish way! This article is taken from the introduction to the web site of Proper-Spanish-Tapas.com and written by Steve who has created a fascinating web site looking at this famous facet of Spanish cuisine.